With romance, elegant parties, and dashing, uniformed gentlemen, this charming castle story is almost what one might expect. But add in dramatic police raids and rumors of bodies buried in the garden, and it becomes the very unique tale of Sam's Castle. 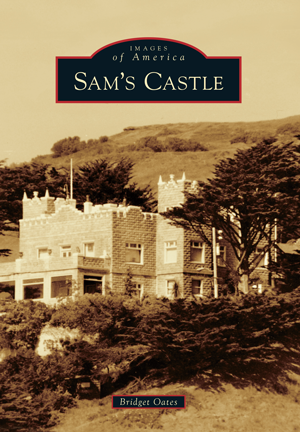 Built in 1908 as a haven for the earthquake-rattled Henry Harrison McCloskey (grandfather of former congressman Pete McCloskey), the castle served as a home, speakeasy, rum-runner signaling station, abortion clinic, and U.S. Coast Guard lookout during World War II. Despite its turbulent history, however, this castle story has a happy ending. In the care of the Sam Mazza Foundation, the magnificent estate will remain a treasured Pacifica landmark for all to enjoy. Bridget Oates is a professional writer with a passion for history. Shortly after moving to Pacifica, she became captivated by the castle and knew this fascinating story had to be told. Working closely with the Sam Mazza Foundation, the McCloskey family, the Pacifica Tribune, the Pacifica Historical Society, and countless locals, this intriguing tale now comes to life through nearly 200 historical photographs.